A detailed report by OpenSignal’s Francesco Rizzato has revealed certain valuable facts. 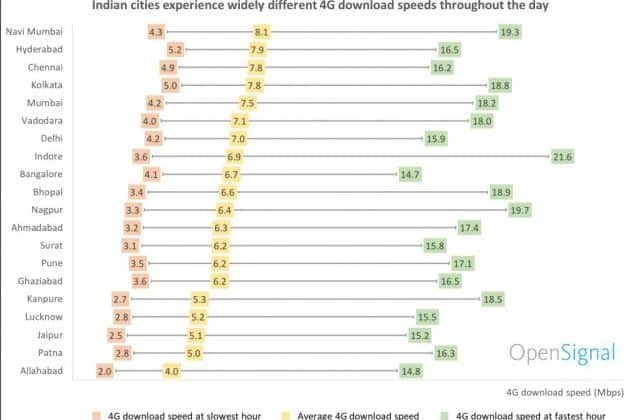 OpenSignal has measured 4G download speeds across 20 of India’s largest cities and observed that smartphone users experience varying speeds depending on the city they live in: while Navi Mumbai scored 8.1 Mbps in average LTE download speed in its measurements, Allahabad came last with an average of 4.0 Mbps – half the speed. The wide range between a city’s fastest hourly speed and the average speed smartphone users experience shows the challenge India’s operators face from the need to support a really big number of smartphone users consuming mobile data services. At night speeds experienced are much faster than during the day. OpenSignal data shows that at 4 a.m. smartphone users in the 20 cities analyzed experience average download speeds of 16.8 Mbps, compared with the daily average of 6.5 Mbps. At 10 p.m. smartphone users experience the slowest speeds when congestion is highest. All the cities show a similar trend with download speeds tending to decrease over the course of the day, reaching the slowest speed in the late evening at 10 p.m., when presumably most smartphone users are connected to the network accessing entertainment services such as mobile video. Then, speeds improve sharply to an early morning peak at 4 a.m. – when most people are asleep – and finally start falling again as people wake up and use their phones. The hourly results show clearly that the time of the day, and consequently the proportion of smartphone users that are likely to connect to the network, explain a big part of the difference in experience. However, the breadth of the speed difference between cities varies. During congested times, users across all cities had a much slower experience, with 4G download speed ranging from 2.5 Mbps to 5.6 Mbps — a 3.1 Mbps difference — while in less-congested hours the speeds experienced increased by approximately 9.8 mMbps to range from 9.9 Mbps to 19.7 Mbps. OpenSignal’s results thus suggest that network congestion is one of the main reasons why smartphone users in India experience a relatively slow average 4G download speeds. We observed that Indian cities face different degrees of congestion and that users experience speeds over 20 Mbps at quiet times. But this only occurs in the middle of the night: in the daytime, the large number of connected devices erodes the networks’ capacity and adversely affects everyone’s mobile network experience. “Indian mobile operators have made huge steps forward in tackling the challenge to offer nationwide affordable connectivity to the world’s second most populated country. However, with an increasing number of people accessing mobile services, cheaper smartphone devices, and rising average data consumption per user, India’s mobile operators can expect the number of connected devices and data traffic to continue soaring and the challenge of network congestion to persist. As soon as the 4G availability race has been played out, operators will need to focus on continuing to increase network capacity to ensure all the connected smartphone users can get a more consistent download experience throughout the day across all of India,” commented Francesco Rizzato in his report. OpenSignal reveals India’s 4G download speed report; Navi Mumbai tops list, Allahabad comes last 0 out of 5 based on 0 ratings. 0 user reviews.